The magnetostrictive sensors of the MSB series from WayCon Positionsmesstechnik GmbH impress with their extremely small and robust design. The sensors are available for measuring ranges from 50 mm to 4000 mm with two mounting mechanisms. The model with plug-in flange and cable outlet measures only 131.5 mm in length with a diameter of 33 mm, the version with threaded flange and plug outlet measures 140.3 mm with a diameter of 36 mm. (Stated lengths increase by the respective measuring range.) Thanks to the IP67 stainless steel housing, the MSB series transducers tolerate a permanent operating pressure of up to 350 bar and are resistant to shock, vibration and contamination. The transducers have a linearity of up to ±0.02 % and a displacement speed of up to 10 m/s. The touchless, thus wear-free magnetostrictive principle ensure reliable measurements without reference run. At measuring ranges < 2500 mm the sensors can be used at a temperature range from -30 °C to +90 °C, at greater measuring ranges up to +75 °C. The magnetostrictive transducers are available with analogue or digital START/STOP output signal. 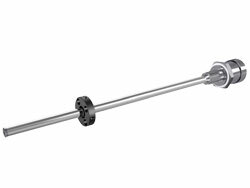 The transducers are multifunctional, can be used inside and outside of cylinders and are suitable, for example, for use in the hygiene sector, the chemical industry or even in the pharmaceutical industry. Specific applications are for example regulating the flow of an actuator or measuring liquid levels. The very compact size makes the MSB series transducers optimal for future applications in mobile hydraulics.